It was recently brought to my attention that there is quite a big difference between a road and a street in their function and design. Usually these terms are inter-exchanged freely and while I am fluent in the design of streetscapes and networks, I never sought out the difference between the terms. While both are elements in the public realm, a road is primarily for transportation or circulation. A street has a more active role as a facilitator for activity and community. A classic examples of a road is below. It is used to get to point A to point B and while there might be development on either side, people do not spend time there. While urban designers might decide where roads are located, their specific design is more the work of highway engineers and transportation planners. But streets are where the magic happens. Street festivals, parades, bicycling to brunch on a spring day, finishing up books during lunch breaks, or strolling leisurely at dusk all can happen in a street. Foremost, well-designed streets put all users on the same playing field: drivers, pedestrians, and cyclists can all use this space comfortably. This is a task that engineers are usually not capable of. How do streets achieve this? Grade Changes: Grade changes, or lack there of, are used to communicate to users how to use a street. The less there are, the more judgement drivers, pedestrians, and cyclists will have to depend on in navigating a space. This can slow down traffic and place more priority on other users. A homezone, seen above, is a type of street designed on one grade often used in residential areas, to promote community interaction and social inclusion. Paving Materials: When fewer grades are used in street design, different paving materials can be used to designate certain uses. Parking spaces can be designated by brick, cycle lanes in yellow stone, and the rest of the street in gray pavement to clearly communicate their uses. But because the street is on one grade, these spaces can be “borrowed” by other uses when not being used. This allows the street to be more flexible to the needs of users. Active Pavement: People spend time where they feel safe and have a reason to be there. In commercial areas, storefronts, cafes, and restaurants should have many windows and doors that allow the maximum amount of activity to spill out onto sidewalks. Outdoor seating and window shopping are classic examples of this. In residential areas, the rooms where the most time is spent (usually the living or family room) should over look the street. As many doors as possible should lead to the street, even in an apartment building setting, to encourage the safety of spending time there. In the above picture, these two boys can be easily monitored by their parents and neighbors as they play soccer. Street Furniture: To really allow a space to be active and well-used street furniture most be provided. And not your typical park bench that restricts how it is used (sitting side by side isn’t a natural position to talk to one another), but creative pieces, walls, and steps that allow for groups of people and different sitting positions. 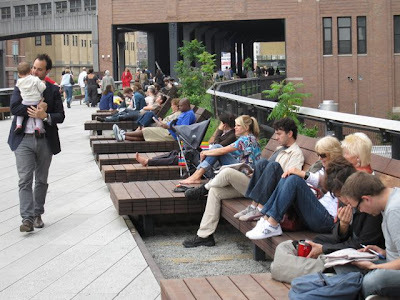 Without a place to sit, reading, eating and people watching (some of the most common street activities) aren’t possible. Pockets of Open Space and Other Elements: Allowing space within the street network for larger events than every day activity will help boost community activities and interaction. Pocket parks are perfect for picnicking and frisbee throwing, while fountains are perfect for cooling off your feet on a hot summers day. Of course in many situations the above elements are not appropriate. Often streets within the city are desperately needed as transportation routes for cars and public transportation. But that doesn’t mean that these streets only have to be used to get from point A to point B. They can still provide lots of social interaction. The perfect example? A boulevard. Lanes of traffic are left open and are clearly marked. Sidewalks are on either side of the street, and often down a median in them middle. They are wide, well-planted, and with street furniture. They can accommodate high levels of activity from bordering buildings. Crossings are often provided and can sometimes (depending on traffic volumes), be at the same grade as the sidewalk. Parallel parking protects the pedestrian and makes them feel more comfortable around traffic at higher speeds and volumes. Lighting and landscaping are used as elements that soften the pedestrian space and allow it to be used more times during the day and year. There are many ways to design a street. Every urban designer has building blocks of urban elements that they can put together in different ways to create a streetscape. Knowing when to use which elements and how to create a street hierarchy to create a legible and clear identity for an area, is when urban design is crucial. Even when what a place needs most is a way to get from point A to point B, there are always ways to bring activity to a street, and therefore a neighborhood.